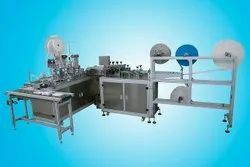 Pioneers in the industry, we offer fully automatic mask making machine with inner loop, fully automatic mask making machine with tie loop, fully automatic mask making machine with outer loop and automatic cup mask making machine from India. We are engaged in offering a wide range of Hi- Tech Mask Inner Loop Welding Machine to our clients. Our experienced technocrats manufacture this machine making use of quality assured components and advanced technology as per set industry standards. The offered machine is used to weld inner loop on mask in a proper way. Moreover, this machine is tested by our quality auditors to eradicate any kind of defect. Our valued patrons can buy this machine at an affordable price. 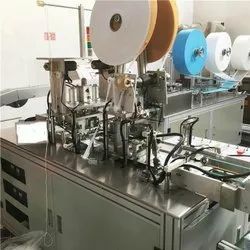 Automatic mask production line, also known as one to three mask production line, composed of a mask body machine and three ear band composed of welding machine. Every minute can output 80-120 pieces of complete plane mask, mask specifications: 175*(80-100) mm 1-4 layers of non-woven planar filter type mask. Compared with the single independent type mask making machine, joined the automatic conveyor belt and the connecting port, the unique design in addition to improve the production efficiency, reduce artificial cost, is in order to minimize the artificial participation, and reduce the risks of a mask is pollution in the production process. 1. Ultrasonic melting technique, single man operation. 2. Automatic working from feeding to nose-wire insert, lace sealing, cutting finished products. 3. Machine frame adopts aluminum. Anti-rust, durable, easy cleaning and neat. 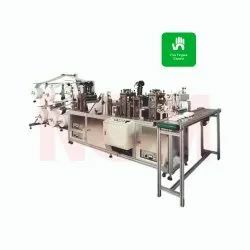 Automatic Cup mask production line, also known as one to three mask production line, composed of a mask body machine composed of welding machine. Every minute can output 80-120 pieces of complete plane mask, mask specifications: with 1-5 layers of non-woven planar filter type mask. Compared with the single independent type mask making machine, joined the automatic conveyor belt and the connecting port, the unique design in addition to improve the production efficiency, reduce artificial cost, is in order to minimize the artificial participation, and reduce the risks of a mask is pollution in the production process. Looking for Automatic Nonwoven Face Mask Making Machine ?